Northern New South Wales sports a number of excellent dive sites. Sites south of Byron Bay are normally best done as a weekend or a multi-day trip. See Google maps for a good picture of the area between Byron Bay and Port MacQuarie. Byron Bay is a little like Cook Island. The diving conditions can change radically in an hour, particularly water temperature and visibility. The principal dive area is Julian Rocks. See the diagram to the right courtesy of Sundive at Bryon Bay. It is excellent diving, not overly advanced and close to shore for those who are unfortunate enough to suffer from seasickness. The first 2 dive centres promote single dive trips and Blue Bay Divers, a double dive trip. Note that Blue Bay Divers also offer a long 120 minute dive for appropriately qualified divers on twin tank rigs. There is spectacular diving and fish life around the North Solitary Islands. The diving caters for advanced and novice divers. 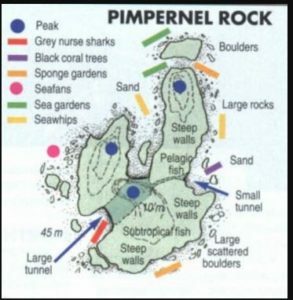 Pimpernel Rock is an advanced dive for experienced divers and very exposed to weather conditions. It can only be dived when the current and weather conditions permit. Diagrams are courtesy of the Wooli Dive Centre. 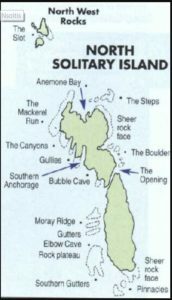 The South Solitary Islands are located in the Coffs Harbour area. This area also boasts excellent diving around the South Solitary Islands with a large number of dive sites to choose from. Picture is courtesy of Fish Rock Dive Centre. 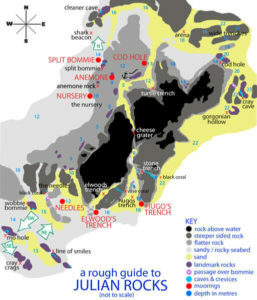 There are a large number of dive sites in the area which is mostly known for the Fish Rock Cave Dive Site. Best dived in summer, autumn or early winter. The water can get a trifle cool towards the end of winter and a dry suit is recommended if diving at this time. The Fish Rock Cave area is also known for its population of Grey Nurse sharks as well as the myriad of other fish life around the Cave and other dive sites. If planning a dive trip, there are many other dive sites worthy of a dive in the area. Best planned away from public holidays as the area is close enough to Sydney and Newcastle to get heavily booked around the public holiday times. Although not a difficult dive, Fish Rock Cave is not recommended for the novice diver. It is an overhead environment and should be treated with caution.